Looking for Rottweiler Puppies? They’re Here! At Furry Babies, we have a variety of dog breeds that we’re sure will fit your needs! Are you in the market for large dogs or smaller ones? What about one of our Rottweiler puppies for sale? We’re sure you’ve seen those big beauties. What do you think? Have you got what it takes to accommodate one of the largest, most protective, yet lovable dogs? If the answer is “yes,” or you’re still wavering, let us impart a little knowledge (of persuasion) of you! First, here are some quick facts. The first Rottie puppy came to the United States in the late 1920s, with a German immigrant. Rottweiler puppies are not highly excitable dogs, but they possess a strong desire to work. Purchase some earplugs, because Rottweiler puppies will probably snore right into adulthood. Why should you buy Rottweiler puppies for sale from us? There are a number of factors that make us the best, but of them is all is the peace of mind we give our customers. 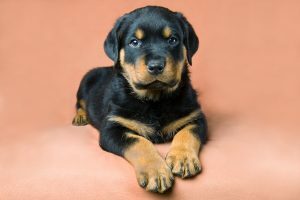 Having the knowledge that we get all of our Rottweiler puppies for sale from reputable breeders. We don’t settle for less. All of our Rottweiler puppies are vaccinated and dewormed. When they go home to you, they will already be checked and certified healthy from a veterinarian. We apply this same standard of care for all of our furry babies, by the way! We know how Rottie lovers adore Rottweiler puppies and we live up to their standards and more! Are you ready to purchase one of our Rottweiler puppies for sale? If you’re ready to add tons o’ fun to your home, give us a call today! If for some reason they’re not the perfect fit for you, no worries! We have many breeds of dogs, check out our available puppies page by clicking here furrybabiesinc.com/puppies-for-sale!